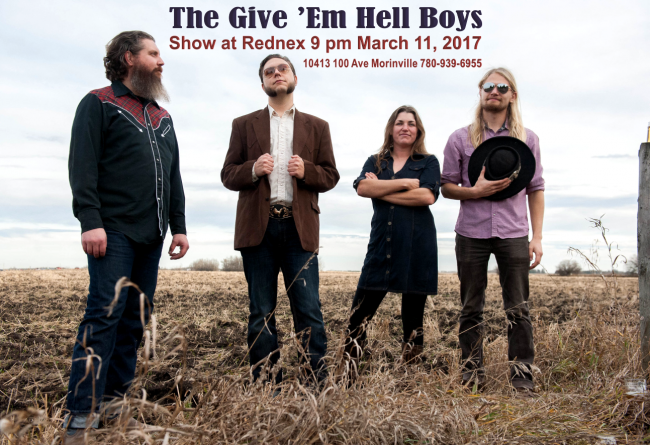 MAR 11/17 The Give ‘Em Hell Boys at Rednex! BIO – It started with a shuffle beat in a room with two like-minded musicians in the most unusual of locales (Edmonton, Alberta) for a punk rock, country band. The beginnings were humble but the evolution was far from that. Like a beautiful whiskey aging in an oak barrel, or a crisp, golden ale fermenting in a vat, the music evolved into a delectable, cacophony of art and joy. Consistent gigs and a pickup truck full of songs in their repertoire kept this four piece band grooving and growing stronger in the Canadian music scene. Echoing the sentiments of their heroes, their brand of country is fused with attitude and high energy. Band frontman and rhythm guitarist Quinn Clark, or ‘hat with beard’ to his friends, describes the importance of a high energy live show: “It’s something that’s immensely hard and nearly impossible to convey on a record. Although we’ve tried our best to do that. I think that’s what I like most about playing in a band; a collaboration with other players. You become each other’s audience”.